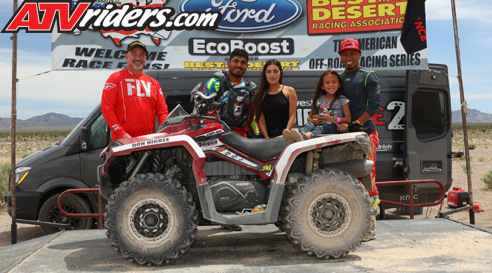 Casper, WY (5/24/2018) - Can-Am Driven Powersports’ rider Don Higbee teamed up with Adolfo Arellano and Jose Torres on a Can-Am Outlander 1000R and finished third in the Silver State 300. 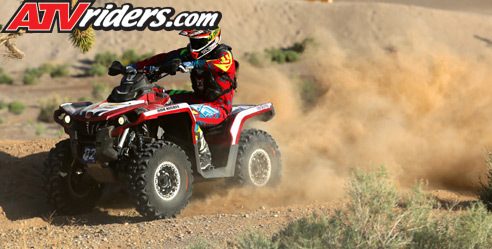 The Best in the Desert Series event was held in the desert and silt beds surrounding Alamo, NV. Riding the only 4X4 Utility quad in the class, Higbee and his teammates were showing just how fast a Can-Am Outlander runs in the wide-open desert. Torres started the event and was within a minute of the leader when an electrical issue caused an intermittent fault in the bike. In addition, the team lost a chase truck to mechanical issues prior to the race. In true racer style, they adapted, improvised and overcame and ran a crew out of a rental truck for the event. Higbee still has a chance at the championship. The BITD ATV season finale is several months away and he’ll be ready with a fresh bike and a continued positive and competitive attitude. Higbee will return to BITD competition for the final ATV race of the 2018 calendar during the Vegas to Reno race, scheduled for August 15-18.